Greeneview senior Hannah Ferrell makes a cross pass early in the first half in a Division III sectional first round tournament game Oct. 16 against Southeastern. Greeneview sophomore Alexa Simpson dribbles through midfield, Oct. 16, in the Division III girls high school sectional tournament soccer match against Southeastern, at Don Nock Field in Jamestown. 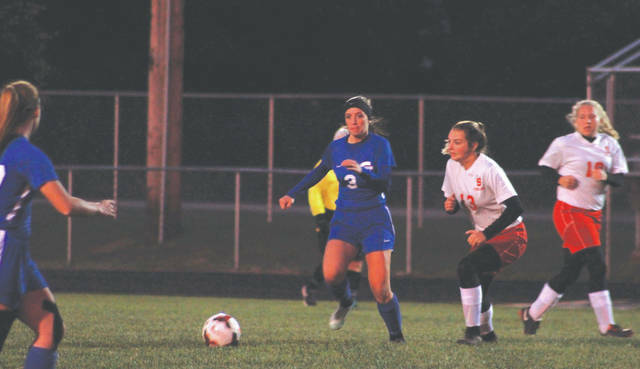 JAMESTOWN—The goals just kept coming for the Greeneview Rams as they shut out the Southeastern Trojans in their Division III girls high school soccer sectional tournament game by a score of 8-0 at Don Nock Field. The Rams sustained constant offensive pressure all night as they took shot after shot. The eighth seeded Rams (11-4-1) looked dominant from the very beginning of the game. The team scored two goals in the first four minutes. As the game continued, the team kept shooting as they got scoring chance after scoring chance. 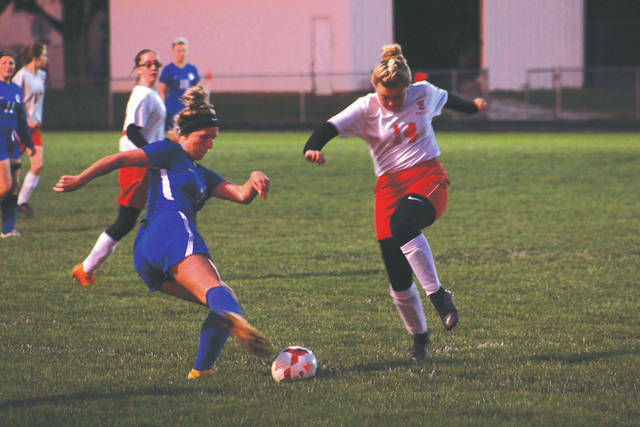 Greeneview junior Faith Rutherford and freshman Kelsi Eakins led the way for the Rams with two goals each. Senior Kayli Vipperman, junior Ericka Ramey and Sophomores Alexa Simpson and Josie Harris each scored once. The Rams offense was on full display as the team connected on multiple pinpoint passes and quick developing plays. Their speed was evident in their play. There was even a section in the second half where the team scored three goals in less than three minutes. The Rams probably would have scored even more goals if it weren’t for Southeastern goalie Alyssa Lambert making multiple saves throughout the night. Southeastern’s season ends with a 2-11-1 overall mark. Coach Brown said he hopes this big win can help his team build momentum going forward in the postseason. The competition will only get tougher the further into the postseason the Rams go and Brown said that this game can be a building block for his team going forward. The Rams play their second round Division III sectional tournament game at 7 p.m., Saturday Oct. 20 at Don Nock Field against Yellow Springs (2-12-1).